There is a small, nondescript house on one of the country roads that connects me to other roads. I don’t know who lives there now, but one of my high school classmates might have lived there many years ago. Littered on the lawn, on the steps, along the driveway, and towards the property boundaries are Christmas inflatables. I usually drive by the house during daytime hours when Santa, the Bethlehem manger, and Rudolph are prostrate in a plastic heap across the lawn. I don’t care for inflatable lawn ornaments, especially of the Christmas sort. I could create a premise that these ugly monstrosities are symbolic representations of our broken financial system, full of hot air and bound to deflate. Or I could say that they represent the bizarre desire some perfectly lovely Americans have to showcase Thanksgiving Day parade dirigibles on their lawns, just because they can. I don’t have anything good to say about them, other than their production employs some Californians. I woke up on Friday morning feeling like a deflated Christmas lawn ornament. I don’t think I’m alone in this feeling. We all try to put our best foot forward during this “Most Wonderful Time of the Year” and it’s exhausting. The consumer way of life we’ve been taught is at odds with the message of Christ and it creates dissonance and doubt. I’m not a theologian or a philosopher; I’ve discussed “Christmas” with different wise men and women. Someone somewhere has an inflatable Jesus on their front lawn. I just know it. 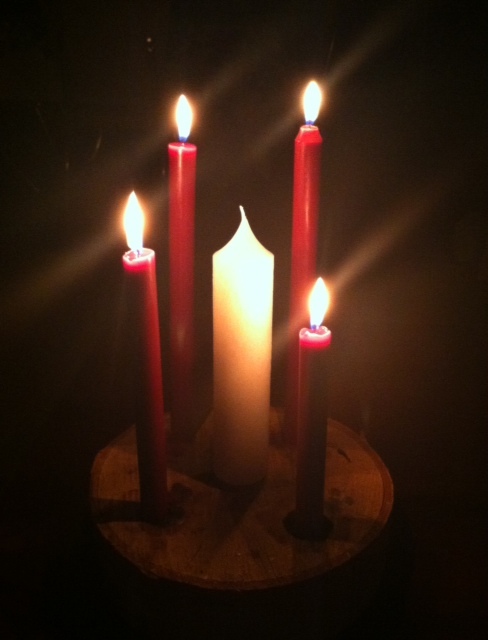 It is the fourth Sunday of Advent. This entry was posted in Today We Rest and tagged Fourth Sunday of Advent, Galatians 6:2, inflatable lawn ornaments. Bookmark the permalink. Maybe our little ice storm on Sunday helped people to slow down and enjoy some peace and tranquility. Umm, inflatable Jesus. Inflatable creche. Come on down, we’ve got it all.